Casa Galleria is a row house building located in the midst of a medieval Florentine neighborhood at Borgo Ognissanti 26 near the Piazza Ognissanti, which opens to the Fume Arno. The building was designed by Giovanni Michelazzi for Argia Marinai Vichi in the Stile Floreale. Casa Galleria was originally designed as a private residence and gallery space, which are functions that continue today in the form of apartments and commercial space. Michelazzi designed a building that is both respectful to the tradition of the surrounding urban fabric and a showcase of modern building materials and ornament. As development pushed beyond the boundary of the Roman-era fortification walls in the early medieval era in Florence, new walls had to be built. The area around Piazza Ognissanti developed after that land became enclosed by the construction of the Arnolfo di Cambio wall. The buildings lining Borgo Ognissanti developed, like much of the land outside of the original Roman wall, along axial paths that extended outward from the existing urban fabric into the countryside. Borgo Ognissanti extends out of Piazza Goldini to the northwest and was originally lined almost entirely with row houses. The row house is the typical building block for development during the medieval era. It is a typology characterized by two bearing walls 5-6 meters apart with a street-facing façade that is built out to the street edge. The bearing walls are usually blank and attach to the neighboring buildings. The back of the building often faces a garden unless additions to the building have been made, in which case there is usually a small courtyard or light well. Row houses can range in height anywhere from one to four stories and depending on the wealth of the owner may contain an altana (attic) for laundry and servants. As the population of Florence grew in the medieval era, it was normal for shops and businesses to open on the ground floor of row houses in older sections of the city. The row house is an immensely adaptive building typology and although many of the properties along Borgo Ognissanti were combined during the Renaissance and converted into in-line houses, Borgo Ognissanti 26 remains a row house to this day. In 1865, Florence became the Italian capital and “Poggi produced a plan for expansion” of the city. The plan extended beyond the old city walls to create new neighborhoods that would be developed in the neo-renaissance style and serve as residential areas for the upper middle class. By the turn of the 20th century, new building materials could be created around the world that had no connection to local resources. For the first time in history, architecture was not limited to what natural materials were close by and this allowed for a more universal language of design to develop. Florence, however, with its rich Renaissance history was slow to accept new styles. It was not until the 1910s in Florence’s Campo di Marte neighborhood that experiments of design began popping up. The Stile Floreale was an architectural style popular in Tuscany at the turn of the 20th century that was explored by Giovanni Michelazzi in Florence. The style was connected to the larger Art Nouveau movement, which represents the beginning of the modern movement and an early exploration of a universal design language. The development of steel and concrete allowed for new shapes to take form, taller heights to be attained and larger spans to be achieved. New found wealth also allowed for the creation of new building typologies such as the villino and pallazina, which were often constructed new as detached single family houses surrounded by gardens. These buildings are typically smaller and two stories with a large portion of the cost going towards the 3-4 facades of the building. Like the Art Nouveau, Stile Floreale is still very much connected to the classical tradition through human scale details, proportions, and craftsmanship. Giovanni Michelazzi had worked in Florence since the early 1900s and had built up a substantial portfolio of re-styled pallazina. 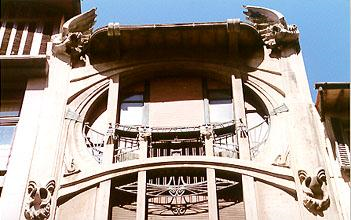 Casa Galleria, Michelazzi’s masterpiece, was commissioned by Argia Marinai Vichi and built in 1911 on Borgo Ognissanti. The building is located on a pre-existing medieval row house, which was redesigned on the interior and the façade was demolished and rebuilt with Michelazzi’s design. The existing conditions of the site allowed for less freedom than a free standing pallazina because there were pre-existing buildings on either side of Casa Galleria. Michelazzi used the circumstances as an opportunity to showcase the Floreale style and be extravagant with the design. The building is five stories with a commercial ground and mezzanine floor and three residential floors above. The ground and mezzanine floors are united under a single archway on the façade with the mezzanine windows reminiscent of the Roman thermal window. The center windows on the next two floors above terminate at a massive circular window on the top floor. The façade is symmetrical and highly ornamented with cement sculptural elements. The exterior cladding is made from Portland cement and is scored to imitate Roman travertine stone. Vertical lines of cement dominate the façade and give the appearance of soaring heights, which are accentuated with eagles and dragon wing iconography as inspired by the advent of flight and Eastern world influence. 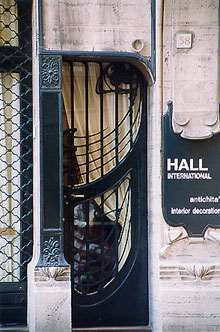 Wrought ironwork is used throughout the façade to create window frames and railings. The ironwork was manufactured off-site and made to look handcrafted with intricate detailing such as twisted balustrades and circular curving railings. The traditional roof is incorporated into the façade by extending cement vertical elements into the overhang of the roof. Human figures are also used as artful displays on the façade. Massive protruding eagles are created to hold iron-cladded lamps over the street as a way of showing off the wealth of the owner, displaying new technology, and providing the valuable function of lighting the streets for the public. At the time of construction, Casa Galleria was a shocking design that was heavily disliked by people in Florence. As a result, Michelazzi opted for a more reserved style in subsequent projects, which may have contributed to his decision to eventually take his own life. In my opinion, Michelazzi’s design for Casa Galleria has a solid foundation in the Florentine tradition from the Roman beginnings up through to the years when Florence was capital of Italy. While the central placement of the windows on the façade is not familiar to the row house tradition, the resulting verticality on the façade of Casa Galleria is connected to the tower tradition of Roman city wall watch towers and entry gates. The row house typology is still evident in the layout of the floors and the entry into the building; a front door off to one side brings you into an entry hall that accesses the central stair up to the residential portion of the building. The symmetry of the façade and use of human figures is reminiscent of Renaissance ideals. The organic, rounded shapes of the windows and ironwork as well as the fabric texture on the faux columns are familiar to Baroque architecture. Even with its influence from the wider world, new materials, innovative construction techniques, and technology, Michelazzi’s Casa Galleria managed to keep the building connected to its geographic and historic context. With the world rapidly changing, Casa Galleria was both respectful to the established urban fabric and acknowledging of the major advancements of recent times. This design was also connected to contemporary Florence at that time, which was growing outside of the Poggi expansion era. The late 19th century architecture in Florence was heavily influenced by the revival of the renaissance style, which itself was a revival of classicism. Michelazzi may have been reacting to what some perceived to be “weakness for antiquarian kitsch and stylistic revivals”. Art Nouveau was a style that finally broke from the cycle of classical design and allowed architecture to move in a new direction. Michelazzi was sensitive enough to understand the resistance of Florence to move beyond the renaissance style, but he also wanted to explore these new modern materials and techniques, which is why he did a contemporary design that was informed by the context. It is unfortunate that Casa Galleria was not seen for its complexity in its own time because if it were, there is no telling what Michelazzi could have accomplished.